The Eclipse Advanced Scripting Environment (EASE) project is a new but powerful set of plugins that enables you to quickly hack your Eclipse IDE. In this article, based on my talk at EclipseCon North America this year, I'll cover the basics of how to set up your Eclipse environment with Python and EASE and look at a few ideas to supercharge your IDE with the power of Python. Setup and run "Hello World"
The examples in this article are based on the Java-implementation of Python, Jython. 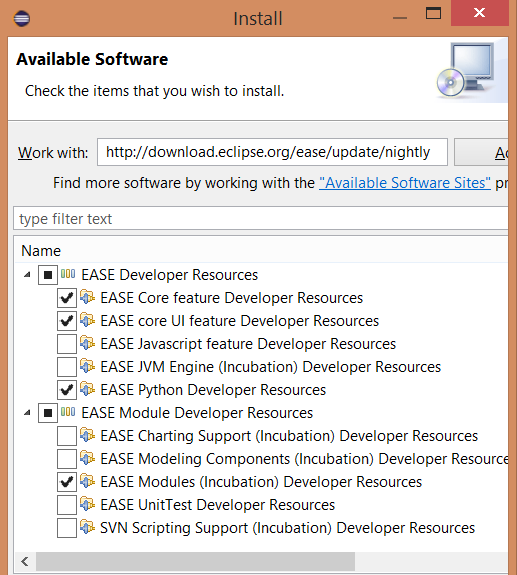 You can install EASE directly into your existing Eclipse IDE. 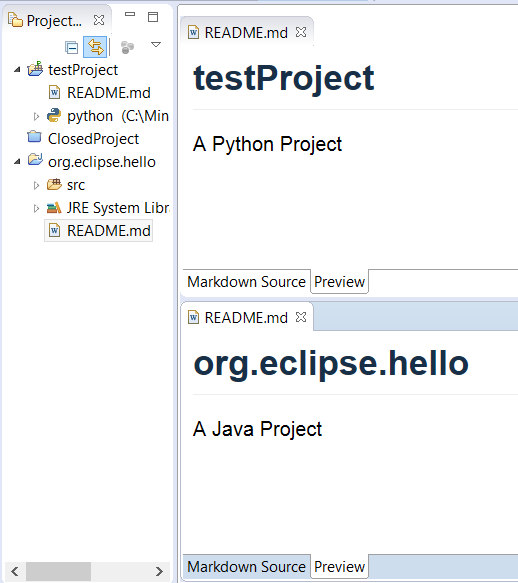 In this example we use Eclipse Mars and install EASE itself, its modules and the Jython engine. This will give you EASE and its modules. The main one we are interested in is the Resource module that gives you access to the Eclipse workspace, projects, and files API. Select the file, right click, and select 'Run as -> EASE script'. You should see "Hello World" appear in the console. Now you can start writing Python scripts that can access the workspace and projects. This power can be used for all sorts of hacks, below are just a few ideas. To run, copy the file to your workspace, then right click and select 'Run as -> EASE script'. 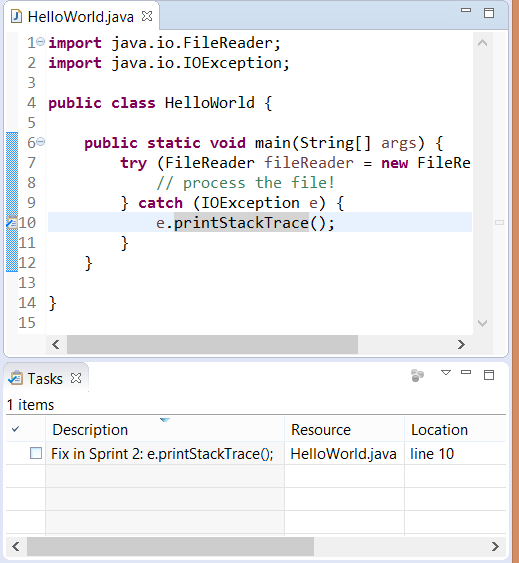 If you have any java files with printStackTraces you will be able to see the newly created markers in the Tasks view and in the editor margin. When you are working with several projects you may want to automate some tedious, repetitive tasks. Perhaps you need to add in a copyright header to the beginning of each source file, or update source files when adopting a new framework. For instance, when we first switched to using Tycho and Maven, we had to add a pom.xml to each project. This is easily done using a few lines of Python. Then when Tycho provided support for pom-less builds, we wanted to remove unnecessary pom files. Again, a few lines of Python script enabled this. As an example, here is a script which adds a README.md file to every open project in your workspace, noting if they are Java or Python projects. See the source code: add_readme.py. The result should be that every open project will have a README.md file, with Java and Python projects having an additional descriptive line. Before running this script you will need to turn on the 'Allow Scripts to run code in UI thread' setting by checking the box under Window > Preferences > Scripting. Then you can add the file to your workspace, right click on it and select 'Run As>EASE Script'. A save message is printed out in the Console view every time an editor is saved. To turn off the autosave just stop the script by pressing the 'Terminate' red square button in the Console view. One of the best things about EASE is that it allows you to take your scripts and quickly hook them into UI elements of the IDE, for example, as a new button or new menu item. No need to write Java or have a new plugin, just add a couple of lines to your script header—it's that simple. Here's an example for a simplistic script that creates us three new projects. To get the buttons to appear, add the two script files to a new project—let's call it 'ScriptsProject'. Then go to Windows > Preference > Scripting > Script Locations. Click on the 'Add Workspace' button and select the ScriptsProject. This project now becomes a default location for locating script files. 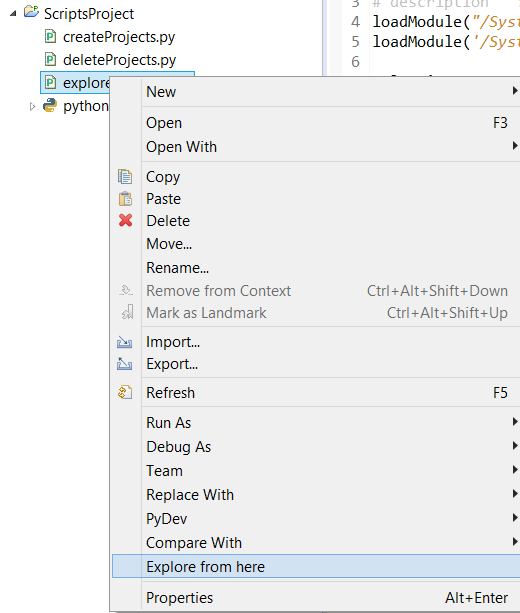 You should see the buttons show up in the Project Explorer without needing to restart your IDE. You should be able to quickly create and delete the projects using your newly added buttons. To get the menu to appear, add the script to a new project—let's call it 'ScriptsProject'. Then go to Windows > Preference > Scripting > Script Locations. Click on the 'Add Workspace' button and select the ScriptsProject. You should see the new menu item show up in the context menu when you right-click on a file. Select this action to bring up a file browser. (Note this functionality already exists in Eclipse but this example is one you could adapt to other third-party tools). 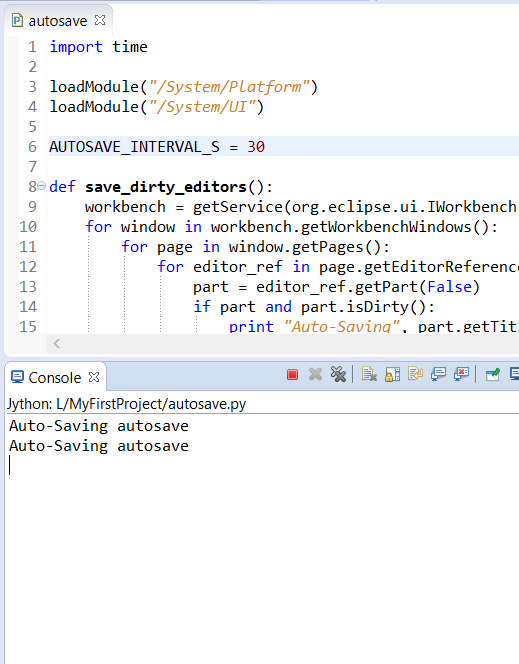 The Eclipse Advanced Scripting Environment provides a great way to get more out of your Eclipse IDE by leveraging the power of Python. It is a project in its infancy so there is so much more to come. Learn more about the project and get involved by signing up for the forum. I'll be talking more about EASE at Eclipsecon North America 2016. My talk Scripting Eclipse with Python will go into how you can use not just Jython, but C-Python and how this functionality can be extended specifically for scientific use-cases. Tracy Miranda - Tracy Miranda is a software developer and founder of Kichwa Coders, a software consultancy specializing in Eclipse tools for scientific and embedded software. Tracy has been using Eclipse since 2003 and is actively involved in the community, particularly the Eclipse Science Working Group. Tracy has a background in electronics system design. She mentors young coders at the festival of code for Young Rewired State. Follow Tracy on Twitter @tracymiranda. Thank you for let me discover this eclipse plugin ! I would like to make a script to request some distant url to include results as task in eclipse. Did you try to use a library like urllib ? I have this error " TypeError: 'javapackage' object is not callable". Do you know if the eclipse version is important ? Earlier versions of the Jython engine had this issue (0.2.0). It has been fixed recently, so to get it to work you can use the latest (nightly) which should be 0.3.0. Both EASE and the Jython engine should be matching version numbers. I (& others) will be happy to help out further on the EASE-dev forums (link in the post).